This is the time of year to remind ourselves of all that we’re thankful for. While I was doing just that, I figured I might as well write down my thoughts and share them with all of you! This entry was posted in Elvira Mistress of the Dark, Horror Hosts, Northwestern University, Svengoolie, Terror from Beyond the Daves, Thanksgiving and tagged Thanksgiving 2013, What I'm Thankful for on December 2, 2013 by Jamie Lee. Svengoolie’s “Zombie No. 5” Is WNUR’s “Track of the Day”! I have very exciting news! 89.3 WNUR FM (WNUR.org) has recently restarted our “Track of the Day” series. DJs, as well as producers and other members of WNUR’s Executive Board, submit music tracks that they believe deserve some time in the spotlight, along with a description for each track. As the name implies, a different music track is featured each weekday on the station’s website, WNUR.org. Today, Svengoolie’s (Svengoolie.com) parody song, “Zombie No. 5” (to the tune of “Mambo No. 5”) was chosen to be the “Track of the Day”––– and just in time for Halloween! I’d like to give a special shout-out and huge “Thank you!” to Dave Fuentes, of the horror-themed blog, Terror from Beyond the Daves (TerrorDaves.com), who uploaded the music video featured in the post, which allowed WNUR to post the track! Thank you, Dave! 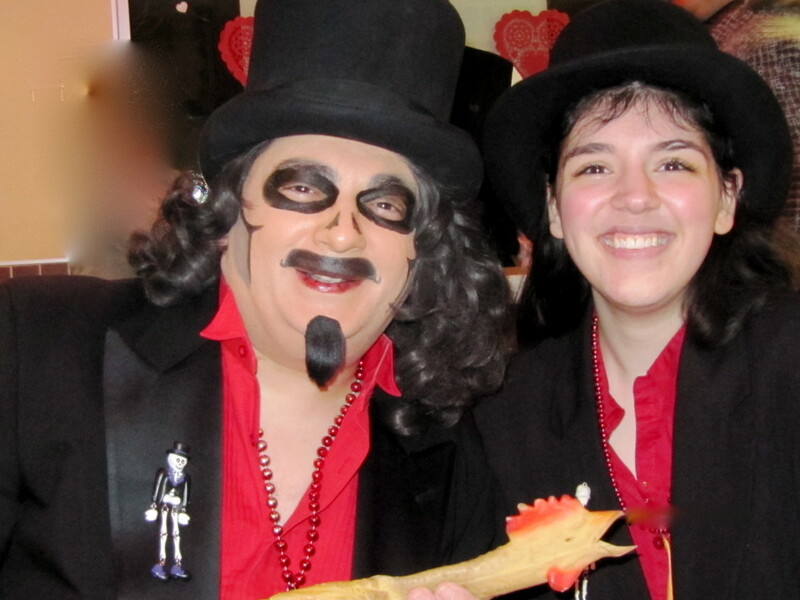 If you’d like a refresher on who Svengoolie is and why you should need to watch his show on Saturday night, you can get it right here! This entry was posted in 89.3 WNUR FM, Halloween, Jammin' with Jamie, Music, Northwestern University, Radio, Svengoolie, Terror from Beyond the Daves and tagged Track of the Day, Zombie No. 5 on October 24, 2013 by Jamie Lee. Spend Saturday Night with “Svengoolie”! I’ve been writing quite a bit about my radio show, Jammin’ with Jamie, lately, so I think it’s high time I actually, well, wrote about something else! It’s officially Halloween season, so I’ll write about something––– or rather, someone––– often associated with Halloween. Despite this association, however, he’s around all year long, and if you ever need something to lift your spirits (pun intended) at the end of the week on a Saturday night, he’s there to help. If you’ve had the best week of your life, he’ll make it even better. If you’ve had the worst week of your life, he’ll help you end the week on a high note. I can say both of these statements with certainty because I have experienced both. No matter what your mood may be, he’ll brighten it. You’ll find yourself smiling, laughing, and thoroughly enjoying yourself. His name is Svengoolie. And if you haven’t seen his show, you should. Scratch that: you need to. “Who’s Svengoolie?” you ask? Tell me more about Sven! This entry was posted in Jammin' with Jamie, Rich Koz, Svengoolie, Television/TV, Terror from Beyond the Daves on October 19, 2013 by Jamie Lee.